For those looking for a modest bass setup, check out our new single box offering with attached amp shelf. This box is very similar to our dual box, but is essentially a customized version. 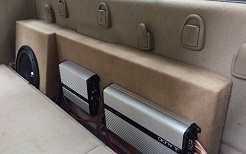 Both the volume of the enclosure and length of the amp shelf can be altered to achieve precisely what you are looking for. The box is still contoured to fit the back wall like our dual boxes for the same great fit. 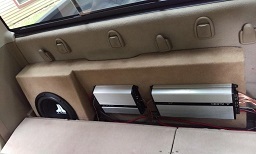 Speaker box on the passenger side only. Sub portion can be standard duty or deep heave Duty (DHD) like we offer on our other Mega Cab boxes, which adds an inch of depth and heavier grade materials. Important: Please check the bump on the back wall of your cab. Most Early Mega Cabs have a narrow bump and Later Mega Cabs have a wide bump. We are not exactly sure where the cutoff lies (somewhere around 2012 or 2013) or why dodge went to the wider bump in later years. So Please check and order for your style carefully. If you are not sure what we mean by "bump", click on the More Images tab and Expand the pics and you will see exactly what we mean.